This woven purse is 30% silk, 20% nylon, and 50% flax, and was made in Milan, Italy by Studio Di Tessitura, Paola Besana, Paola Bonfante, and Lalla Ranza for Neiman Marcus. It has two 42" long twisted handles which can be pulled freely through the side openings. You can have the straps knotted together as in our picture or have them separate. The horizontal rows of fiber are held in place by vertical rows of clear nylon thread. 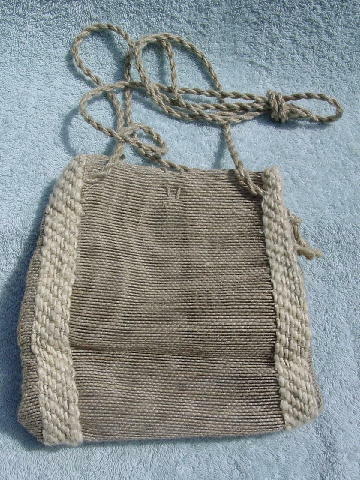 It has a "paper bag" shape and folds flat when not in use. 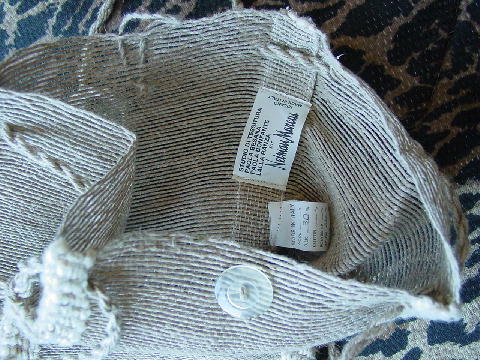 There is a loop and clear button top closure. 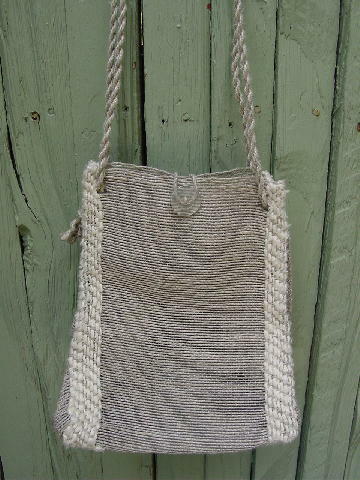 It's in a khaki-flax color with natural (antique white) horizontal woven side accents. It belonged to an Italian model who got it as a birthday present from her exboyfriend. She sold it, even though she loved the purse, because she didn't love him.